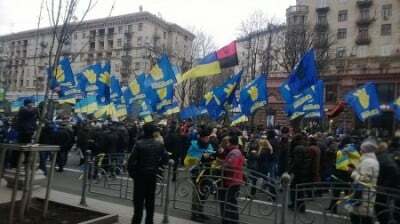 Based on the release of a controversial leaked telephone conversation, we are now in a position to confirm that the Kiev Maidan Independence Square February 20 sniper shootings directed against innocent civilians were ordered by opposition leaders integrated by Neo-Nazi elements. Acknowledged in a leaked telephone conversation between EU foreign affairs chief Catherine Ashton and the Estonian foreign minister Urmas Paet, the Maidan opposition rather than president Yanukovych was behind the sniper killings on February 20. These shooting were directed against both opposition protesters and police. The telephone file was apparently uploaded by officers of the Security Service of Ukraine (SBU) loyal to president Viktor Yanukovych indicating that the power structures of the coalition government are fragile, to say the least. Urmas Paet “And second, what was quite disturbing, this same Olga [Bogomolets] told as well that all the evidence shows that the people who were killed by snipers from both sides, among policemen and then people from the streets, that they were the same snipers killing people from both sides,” the Estonian FM stressed. 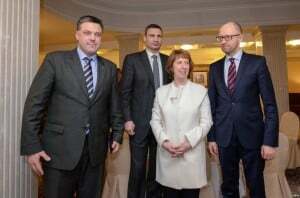 While the EU’s High Representative for Foreign Affairs and Security Policy Catherine Ashton does not have “blood on her hands”, she has had frequent meetings with Oleh Tyahnybok, leader of the Neo-Nazi Svoboda Party, who in all likelihood was involved in the sniper killings. “Well, yeah…that’s, that’s terrible.” says Catherine Ashton. But what is the followup? Will the matter be debated by the EU Commission or will it be hushed up? The February 20th Sniper Killings: What Happened? Acknowledged by media reports, more than twenty opposition Maidan protesters were killed by professional snipers on February 20. This was not a spontaneous event resulting from clashes between protesters and riot police, nor was it marked by an exchange of gunfire between the police and the Neo-Nazi militia. The sniper killings had the hallmarks of a carefully planned operation. They happened within ‘the space of a few hours”. They were carefully timed. The killings coincided with the meetings of President Viktor Yanukovych with a high level EU delegation. In a bitter irony, these targeted killings were used as a pretext to topple the government and issue an arrest warrant directed against president Yanukovych on charges of “mass murder” of Maidan protesters. Now confirmed by the leaked telephone conversation, the purpose of the sniper killings was to provide a pretext for “regime change”. There were reports of snipers on rooftops using automatic weapons, but the identity of the snipers was not known. Invariably the Western media would refer, without evidence, to “government snipers”. Most of the Western media reports failed to acknowledge the role of armed Neo-Nazi gunmen and thugs who had integrated the protest movement and who were involved in systematically inciting violence. We are dealing with a diabolical agenda: the deaths of protesters in Maidan square triggered by Neo-Nazi elements (supported by the West) were used to break the legitimacy of a duly elected government. Members of the Coalition Government Were Behind the Sniper Killings? It should be noted that at least two of the main Neo-Nazi Maidan paramilitary leaders who in all probability were directly or indirectly involved in the sniper killings now occupy positions of authority in the new government, overseeing the armed forces, police, and the prosecutor’s office. Andriy Parubiy co-founder of the Neo-Nazi Social-National Party of Ukraine (subsequently renamed Svoboda) who now heads the powerful National Security and National Defense Committee (RNBOU) was one of the man leaders of the Maidan riots. He was referred to by the Western media as the “kommandant” of the EuroMaidan movement. 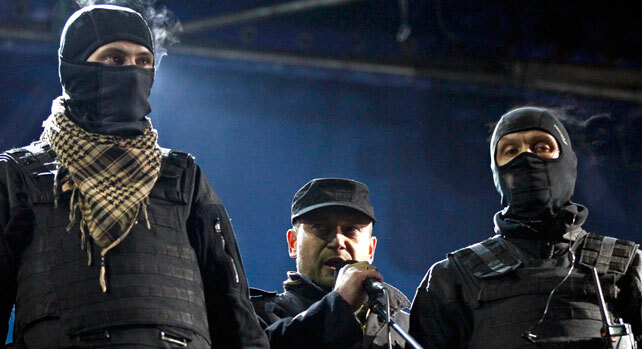 Another key leader of EuroMaidan was Dmytro Yarosh, who currently leads the Right Sector delegation in the parliament. He was appointed deputy Secretary of the RNBOU, which overseas the armed Forces, police,National Security and intelligence. Yarosh was the leader of the Brown Shirt Neo-Nazi paramilitary during the EuroMaidan riots.